A half-pipe skateboard ramp popped up over the weekend in Wampum’s Coney Island pop-up shop. It really turned our head! The ramp brought to mind the Minnesota State Fair, where we saw local skateboarders perform in Lair Skatepark’s X-Zone. Located in Thor Equities “Retail Ride of A Lifetime” Building, which has neither arcades nor amusements, the indoor half-pipe at least brings something unique to Coney Island. It could be year-round “entertainment retail” if the skate shop, which is leasing the space for the summer, decides to stick around. During the rezoning hoopla in 2008, the City proposed the creation of “entertainment retail” in the part of the former 60-acre amusement area designated “Coney East,” yet struggled to come up with viable examples. At a Municipal Art Society panel, Brooklyn Director of City Planning Purnima Kapur replied to a question from the moderator by mentioning Dave & Busters and ESPN Zone, laser tag and virtual reality. Yawn. An indoor ramp where you could see skateboarders do tricks where you also try out and buy boards would be cool. 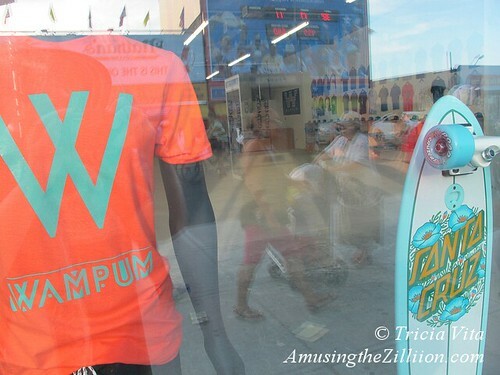 Wampum, which bills itself as a “lifestyle clothing brand and skate shop” and has locations in Bridgehampton and Nolita, opened the 2,500 square foot shop on Coney Island’s Stillwell Avenue for the summer season. When we interviewed Wampum co-owner Lennon Ficalora in April, he talked about putting in a ramp. For now, employees are using it for demos to draw people inside the cavernous store. Will local skateboarders be able to give it a go? They’re looking into the logistics of having the public sign waivers, Wampum’s skateboarding sales clerk said. Update: This Wampum location closed for the season after Labor Day Weekend. Throughout the summer, the half-pipe was used by store employees for demos and as a stage for a rock band. It did not open to the general public. Wow, this might be the single actual “cool new thing” I’ve read about Coney in a while. I know that we’ve all been clutching our pearls about the changes, but change is inevitable, and this at least sounds like change we can live with. Right? The half pipe is definittely the only truly original new thing in Thor’s retail building. Another “cool new thing” happening tomorrow and my next post–the landmark Parachute Jump will be lit with 8,000 LEDs! As in, it will be a sculpture-type of thing? Because that actually seems cool, and certainly better than tearing it down! There are 2 other Wampums, one in nyc, one in Bridgehampton. I don’t want such chains in Coney Island.